Home / Archive / featured / SD TV in an HD TV era: will 2018 bring changes at the BBC? SD TV in an HD TV era: will 2018 bring changes at the BBC? HD is now the norm. So why does it feel that the UK's main channel is behind the times and why is the BBC considering launching a SD-only channel? 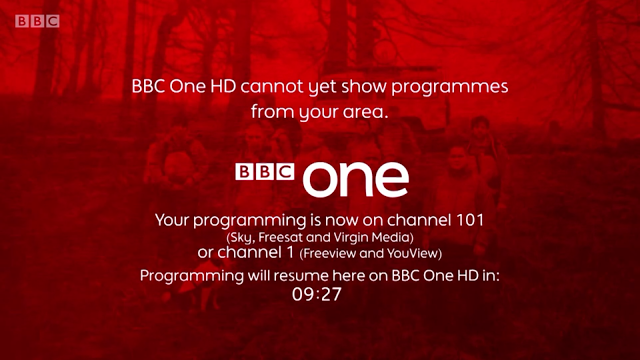 The red screen during the BBC's regional opt-outs on BBC One has become a long-running source of frustration for viewers in England. For years the BBC has been promising that a solution will be found, that proposals to make more regions available in HD have been made and at one point, viewers were given an indicative timeline which would have seen BBC HD regions rolling out right now. Yet HD TV is now arguably the norm: practically every TV set sold in the UK in the last few years can now handle HD, and all devices bearing the new Freeview logo with the abstract "F" must be able to work with Freeview HD. In Ireland, only HD versions of the main two public service channels (RTÉ One and RTÉ2) are distributed terrestrially. In France, the country's digital terrestrial television system was reconfigured to make HD the default resolution for the majority of TV channels. Only HD versions of the main channels are now carried on Germany's new digital terrestrial TV service, HD is the new default in Austria as well. Other countries have seen or are seeing similar developments in HD distribution. Meanwhile, back in the UK, the BBC's plans for its new Scotland TV channel only confirms HD availability via the iPlayer. So why, as we go into 2018, is the BBC apparently still stuck with standard definition? There is more to the issue than at first seems. And the main delay has been money related. Between 15 and 20 years ago, the BBC was experiencing a golden age in regional news. All regional news studios were given a corporate revamp, money was spent on upgrading kit to widescreen, some regions moved to new premises and from 1999, regional news was given the ultimate promotional boost by being embedded within the main news bulletin headlines. But that was then, and in the years that followed, BBC cost-cutting restricted what could be done to upgrade studios and production kit. Technology has moved on dramatically in the past decade, yet insiders say parts of the BBC's regional operations are still reliant on now outdated and obsolete equipment. Three regions form the exception, with BBC South West benefiting from a major refurb of their HQ, BBC North West sharing a studio with HD-enabled BBC Breakfast at MediaCity, Salford. BBC London is at home within the broadcaster's combined home of news, New Broadcasting House. All but one of these regions piggybacked on wider estates changes at the BBC, while the kind of changes undertaken at BBC South West are proving too expensive to implement across the board. Meanwhile, BBC Local Radio has had its production and distribution systems streamlined through the introduction of ViLoR (Virtual Local Radio), which has enabled the BBC to upgrade dated equipment across BBC Local Radio stations at a much lower cost than upgrading each station's unique systems individually. It has also made it easier to make BBC Local Radio services available on iPlayer Radio and on Freeview. BBC Regional TV is in need of a similar upgrade, which would give all of the regions HD capability and make it easier for the BBC to distribute all of the resulting HD feeds compared to the current SD-only configuration that is based on different set-ups at different regional centres. Back in October, in a statement to questions from viewers about the lack of BBC regional news on BBC One HD in England, the BBC said that "upgrading regional news output is a priority for investment." So far, no specific announcements have been made. The iPlayer would be the first beneficiary of this HD upgrade, as it would be able to take the HD versions of the regions and make them available without some the technical challenges that exist when distributing services on traditional TV platforms. Of those traditional TV platforms, the BBC controls its capacity on digital terrestrial TV (Freeview) and on satellite (for Sky and Freesat users). Currently, all of the main five channels broadcasting in HD on Freeview utilise capacity on the BBC's second Freeview multiplex, a result of an intervention by Ofcom around a decade ago, in order to create capacity for HD channels on Freeview. There is limited regionality on that HD multiplex, and that is currently being utilised by ITV to offer some, but not all of its regional HD variants on Freeview. For example, all of the north of England gets ITV Granada HD on Freeview, including viewers in the Yorkshire, Tyne Tees and Border England regions, despite ITV offering HD versions of these regions on satellite. Using the existing regionalisation on Freeview, the BBC could substitute the current BBC One HD service with at least four regional versions across England, but these would cover much larger areas than the current SD regions. Adding additional regionalisation will incur extra costs. However, there are wider changes to Freeview in the pipeline, with a more widespread change to the DVB-T2 broadcast standard used for Freeview HD services expected in the next five years. This may trigger a wholesale change regarding which multiplexes BBC and other HD channels are distributed on, the BBC will want to have a clear roadmap in place before investing large sums of money. It is notable that the UK still doesn't have any public plans to switch-off SD services and make HD the default. With regards the BBC Scotland TV channel, it is hard to see how space could be found at the present time for an HD version of the channel on Freeview, as it would ideally need to have space in addition to the other channels, rather than substituting another channel. On satellite, the BBC has two transponders being used for HD channels. Each transponder carries four HD channels at any one time. However, ITV has made adjustments to to the technical parameters used on its HD transponders, meaning it can carry six HD channels per transponder. If this was applied to the BBC, this would create room for 12 simultaneous HD channels across its two transponders - four more than it has now. This would make it possible to carry the forthcoming BBC Scotland channel in HD on satellite alongside the three English regions that are HD ready: London, North West and South West. Additional transponders would be required for the broadcast of the other regions in HD. It should be noted that the BBC's current plans for the BBC Scotland channel anticipates the current BBC Two England service (which is broadcast in HD) becoming the main network service for Scotland as well, leaving the need for just two more versions of BBC Two HD (Wales and Northern Ireland) to be added, plus 12 further BBC One regions and BBC Alba. Whether it ever becomes possible to accommodate all of the regions in HD on satellite as individual linear streams remains to be seen. However, the BBC has said that it is working on "creative solutions" to resolve the HD issues and has offered a possibility that BBC Scotland TV will be offered elsewhere in HD in due course.